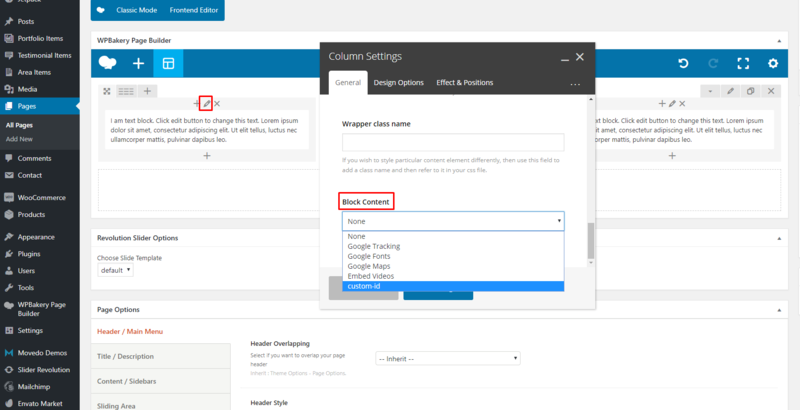 Additionally, we have added custom blocking options that can be set by the Privacy/Cookies Options and have the ability to control your content by column. All you have to do is to create some custom blocking IDs. For this example we have a set a blocking ID named custom-ID. Among the already available shortcodes, now you can use this one as well: [movedo_privacy_custom id=”custom-id”]Click to enable/disable custom content. [/movedo_privacy_custom] and customise it as you wish. You could use it in the privacy modal along with the other blocked content. Via the column settings now you have the ability to control which type of content you want to hide for this particular column.